See the main highlights of Vancouver on this four-hour tour before or after your cruise. We’ll take care of your luggage and drop you off at your hotel, cruise ship, or airport after. This fully narrated 4-hour Vancouver City Highlights Tour takes you to the city’s greatest sights. Vancouver is truly a traveller’s paradise consistently voted one of the world’s most liveable cities. Locals are recognized for their friendly nature and welcoming attitude. Perched on the edge of the Pacific Ocean and framed by the British Columbia Coast Mountains, it’s easy to fall in love with this breathtaking city. Discover highlights like historic Gastown, Chinatown, scenic English Bay and the picturesque Vancouver Harbour. Stops in Stanley Park feature Totem Poles as well as spectacular views from Prospect Point. Also, visit the charming farmer’s market at Granville Island and enjoy 360° panoramic views from Vancouver Lookout’s observation deck (admission included) high atop Harbour Centre Tower. If you’re a cruise ship passenger this tour makes for an excellent pre-cruise and post-cruise option. If you have a flight to catch we can take you and your luggage to Vancouver International Airport (YVR) at the conclusion of your tour (no extra charge). Not ready to end your day? Starting December 1, 2016, extend your Vancouver City Highlights Tour by an extra three hours to also include a visit to Capilano Suspension Bridge and the Capilano Fish Hatchery. Ask your tour guide or our guest services department for more information. Suggested Clothing: Dress in layers for the day, including a warm shirt or outer layer. Comfortable walking shoes are recommended. Our tours are conducted on comfortable mini-coaches seating up to 30 passengers and offering exceptional visibility. They are detailed after every tour and are outfitted with heating & air-conditioning for your comfort. Live tour commentary is conducted in English by our friendly, highly trained and award-winning Tour Guides. Hotel specific pick-up times are provided when reservations are confirmed. Stanley Park - Prospect Point - A viewpoint at the highest point of Stanley Park. Granville Island - Stop to wander artist studios, craft galleries and the Granville Island Public Market. 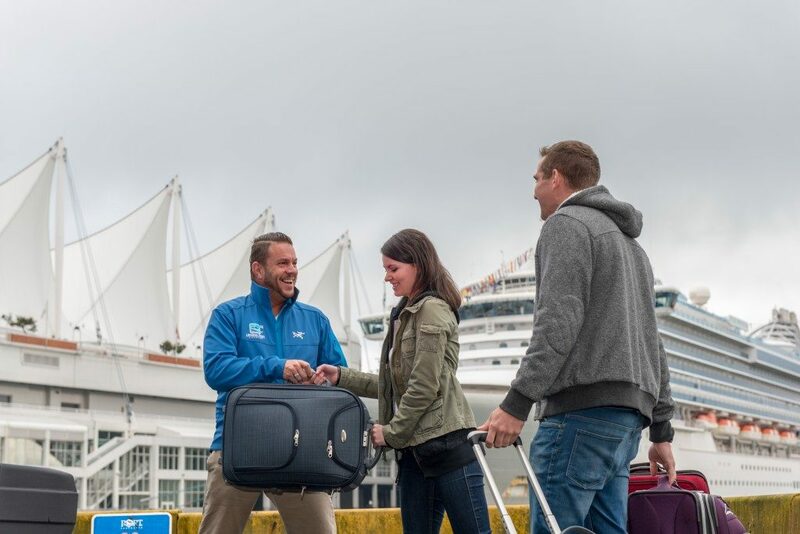 Hotel, Airport or Train Station Drop-off - Cruise Terminal, your downtown Vancouver or Richmond hotels, Vancouver International Airport (YVR), or VIA Rail. Stanley Park – The emerald jewel set in the heart of our city. Stanley Park is a 1,000 acre playground with stunning city views, snowcapped mountain backdrops and the salty smell of the Pacific Ocean. Enjoy a stop at the Totem Poles and get an iconic photo of the sails of Canada Place and the glass and steel towers of Coal Harbour. Then drive on to the park’s highest point. Stop and enjoy a view of Lions Gate Bridge spanning the entrance to our harbour. Dazzle at the panorama of the snowcapped coastal mountains, West Vancouver and English Bay. English Bay – Drive out of the park and along the city’s urban beaches of English Bay. Get a real sense of how fortunate the locals are with access to seaside walks, astounding views and ocean beaches. This is why we love living here! Lucky guests may even spot a couple of our resident bald eagles or great blue herons hunting by these shores. Gastown – This is where it all started, on the shores of the Burrard Inlet – Gassy Jack Deighton laid the foundation of this great west coast city (okay, he opened a saloon). See Maple Tree Square, Vancouver’s oldest architecture, and the world famous steam powered clock. Chinatown – Developed at the turn of the last century by Chinese immigrants from California and China, who came to work the gold mines and railroad. Chinatown today is a bustling reminder of where we’ve come from and where we are heading. Great restaurants, shopping, and interesting architecture (like the world’s thinnest building), all for your senses to feast upon. Robson Street – Enjoy a leisurely drive down Robson Street and get a taste of what is available for those who love to shop! Your guide is also happy to recommend eateries to suit all budgets. Canada Place and Vancouver Harbour – The city’s Alaska cruise ship terminal; an icon of the skyline; Canada’s flagship harbour and our gateway to Asia. Granville Island – This tiny peninsula is a hotbed for good food and great art. Spend time browsing artisan workshops or get some great food and even better views waterside at the Granville Island Public Market. This is a great place to stock up on a few things for the hotel room later or gifts to bring home to loved ones. Granville Island is a short ferry ride across false creek from the downtown core. So feel free to ask us to be dropped here after your tour ends. It’s easy to spend an afternoon or evening exploring this unique place, enjoying some great food or even taking in a show at one of the theatres and just as easy to find your way back to your hotel when you are done. Feel free to ask us to drop you off anywhere in the downtown or Richmond areas and we are happy to oblige – even the airport! With a little advance notice, we can bring your luggage along too, and drop both you and your luggage off at the airport when your tour is finished. Every tour is operated with an air conditioned vehicle with large viewing windows. Guests are free to remain on the vehicle at the stops. All tours are conducted in English by our friendly, highly trained and award-winning tour guides. Pick-up time will be confirmed when reservations are made; tour will begin when all guests are on board and all tour times are approximate.